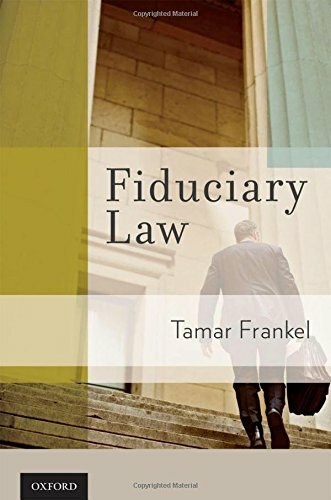 In Fiduciary Law, Tamar Frankel examines the structure, principles, themes, and objectives of fiduciary law. Fiduciaries, which include corporate managers, money managers, lawyers, and physicians among others, are entrusted with money or power. Frankel explains how fiduciary law is designed to offer protection from abuse of this method of safekeeping. She deals with fiduciaries in general, and identifies situations in which fiduciary law falls short of offering protection. Frankel analyzes fiduciary debates, and argues that greater preventive measures are required. She offers guidelines for determining the boundaries and substance of fiduciary law, and discusses how failure to enforce fiduciary law can contribute to failing financial and economic systems. Frankel offers ideas and explanations for the courts, regulators, and legislatures, as well as the fiduciaries and entrustors. She argues for strong legal protection against abuse of entrustment as a means of encouraging fiduciary services in society. Fiduciary Law can help lawyers and policy makers designing the future law and the systems that it protects. Tamar Frankel is a Professor of Law at Boston University. Professor Frankel holds law degrees from the Jerusalem Classes, and LL.M and S.J.D. from Harvard Law School. She is an expert in the areas of fiduciary law, mutual funds, securitization, and corporate governance. She authored The Regulation of Money Managers (2d ed. 2001) (with Ann Taylor Schwing), Fiduciary Law (a teaching book) (2008), Trust and Honesty in the Real World (2007) (with Mark Fagan), Trust and Honesty: America's Business Culture at a Crossroad (2006), Securitization (2d ed. 2006), and about 70 articles on related subjects. She was a visiting scholar at the Securities and Exchange Commission (1995-1997) and at the Brookings Institution (1987). Professor Frankel has taught and lectured in Japan, India, Malaysia, Oxford U.K. and Switzerland. A native of Israel, she served in the Israeli Air Force.